An exciting opportunity to join the Baskin-Robbins family. This is a rare opportunity to buy a Baskin Robbins franchise which is only 2 years old. Just off of route 78 and Village Vista Drive, this shop features about 1,400 sf of end cap space with potential for exterior seating. The city of Vista has a population of more than 100,000. This existing Baskin Robbins franchise has much growth potential for an owner/operator with a passion for retail and ice-cream. No previous experience is required as full training and support will be provided. Having the ability to build a high-performing team dedicated to operational excellence and guest satisfaction is key attribute for new owner. The new owner can benefit of existing regular clients. Ranked one of America’s Top 10 Global Franchises*, Baskin-Robbins is the world’s largest chain of ice cream specialty shops. Since 1945, when two brothers-in-law, Burt Baskin and Irv Robbins, came together to create an iconic American ice cream brand, Baskin-Robbins has introduced more than 1,300 flavors that attract over 300 million guests each year to more than more than 7,700 retail shops in nearly 50 countries worldwide. We are the market leader in ice cream and frozen desserts. 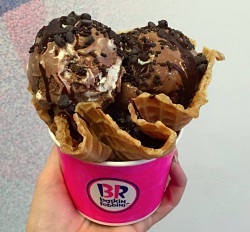 In addition to creative cones, unique cakes, specialty desserts, frozen beverages and take-home items, Baskin-Robbins is the only national ice cream brand to offer both soft serve and hard scoop ice cream. We also offer BRight Choices®, a line of better-for-you options including fat-free, dairy-free, no sugar added and light ice creams. Baskin-Robbins is an American classic - franchising since 1945. As America’s favorite neighborhood ice cream shop, our strategic national expansion plan is to increase our domestic U.S. footprint with exceptional franchise candidates. If you meet our qualifications, have a passion for your local community, and, of course, love ice cream, it’s time to consider joining the Baskin-Robbins family. Knowing your product and customer is the key to success.